Have you noticed a recurring theme around here lately? If you haven’t then you have missed out on a lot of great Halloween-inspired content! In prior years, we’ve talked about decorating for Halloween and what to do with leftover Halloween candy. This year, we’ve been focusing on games that you can play around Halloween, but that you can also play any other time of the year too. Well, you know us and while we have a passion for board games, we also love movies. Whether it’s an animated feature, a superhero movie or a documentary, we don’t discriminate. 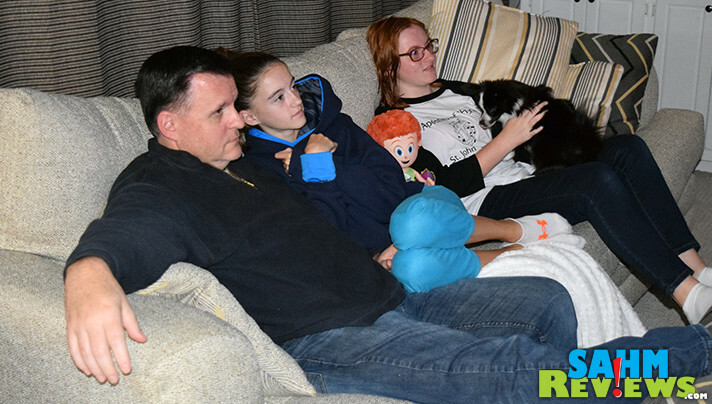 As a family, we regularly set aside time to not only go TO the movies (mmmm… popcorn), but also to veg on the couch and catch one on the DVR, a streaming service or Blu-Ray. 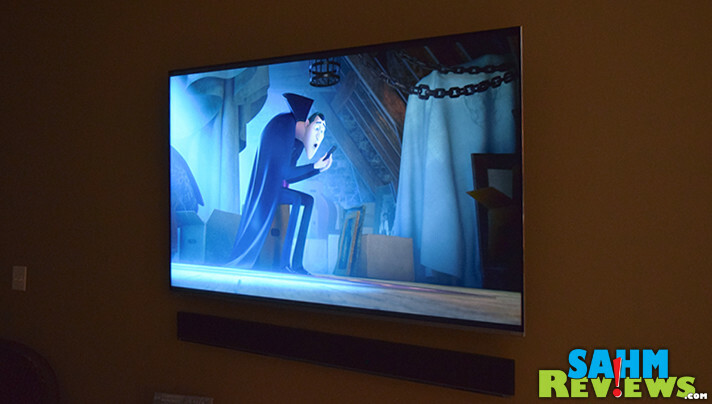 So in the interest of sticking with our idea of things you can do that are thematic, but not specifically Halloween-ish, we’re going to talk about Transylvania – more specifically, Hotel Transylvania! We saw the first two at the theater, but the girls’ hectic schedules have prevented us from seeing anything in the theater since sigh I don’t remember the last time we were there. Maybe I need to turn in my membership card to the catch-a-movie-weekly club. Anyway, since I can’t remember the last time I saw a movie in the theater, it’s also safe to say that my memory of Hotel Transylvania and the sequel is equally as fuzzy. 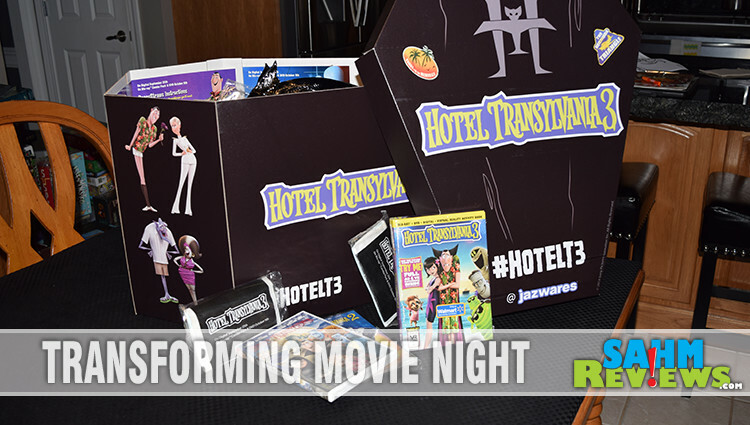 When representatives for Sony Pictures Home Entertainment reached out to us about hosting a movie night to celebrate the Blu-Ray, DVD and digital release of Hotel Transylvania 3, we thought, “Hey, it fits the theme of the month!” So why watch just one when you can have a marathon with all three? The plan was to watch Hotel Transylvania and Hotel Transylvania 2 to remind us about Drac, Mavis, Frankenstein, the place where monsters vacation with their families and Jonathan, the human who discovered the namesake dwelling. Then the movie kit arrived and it was filled with all kinds of things to make our viewing day even more festive! 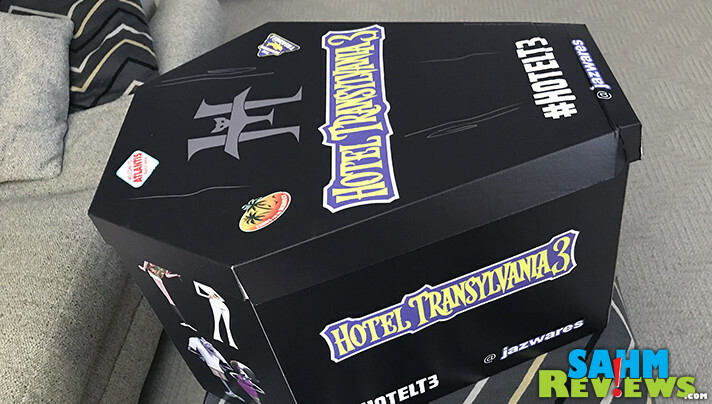 Not only did it include a Hotel Transylvania 3 Blu-Ray, but also a variety of HotelT3 toys from Jazwares AND it arrived in one of the coolest packages, a coffin! With Halloween just around the corner, hopefully you’ve already taken care of your Halloween costume, but have you carved your pumpkins yet? 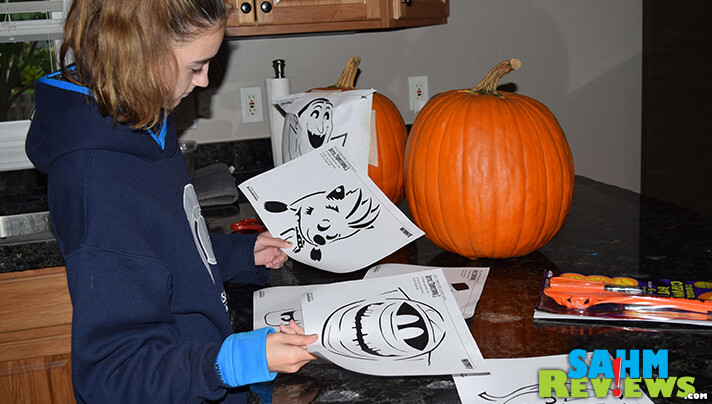 We’ve been too busy so it was fun to discover these Hotel Transylvania 3 pumpkin stencils. We had more stencils than pumpkins so we had to choose which characters would make the cut… literally. 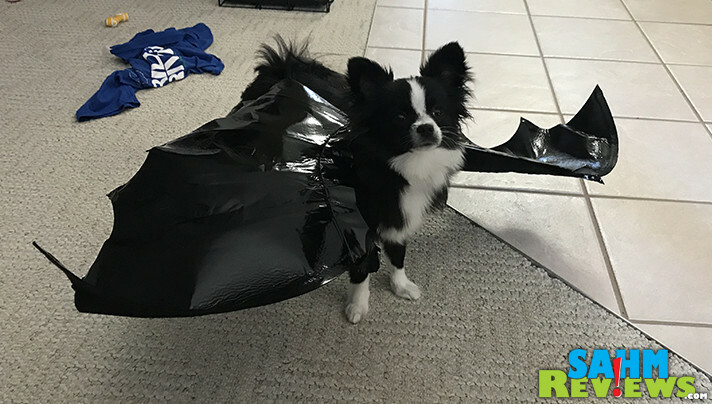 There was even a Hotel Transylvania costume included in the kit which we decided to use to get our puppy in the spirit of the holiday as well. Hotel Transylvania 3 really put forth the effort to be a family movie! I whipped up a batch of Ghoulash (yes, I know how to spell Goulash) to help set the mood and we curled up to watch. While the first two movies established the characters, this one decided to take a vacation from that and, well, go on vacation! Mavis decided to plan a surprise cruise for Drac! The entire monster pack head off on this adventure and nobody could have predicted what happened next. I don’t want to give any spoilers but let’s just say it has to do with Drac and a love interest! A HUMAN love interest! Don’t leave Drac and the crew stranded at sea. Pick up a copy of Hotel Transylvania 3 on DVD or Blu-Ray and find out how the story sails home. Bonus features includes behind-the-scenes scoop, three all new Scary-Oke sing alongs, snacks and crafts, a Vampire Make Over Tutorial, two mini-movies and much more. 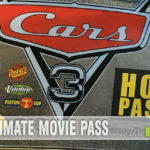 In addition to a lot of fun bonus features, you can also visit the website to download a variety of HotelT3 activities, recipes and song lyrics. 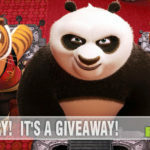 Find out what else Sony Pictures Animation is up to by visiting their website, the HotelT3 website or following them on Facebook and Twitter. Who is your favorite Hotel Transylvania monster? The puppy costume is just too cute and I think Ghoulash is perfect for this time of year. What a perfect thing for this time of year. I have never known much about hotel transyvania! Hotel Transylvania 3 looks like a great movie to watch on Halloween! Loving the costume on your pup…so cute! We love the whole Hotel Transylvania series. I thinkt hat dog costume is so dang cute! My grown up kids still watch animated movies and I love it. We can add this to our movie library and enjoy it for our family’s movie night (usually happens every Friday or Saturday). The dog costume looks so cute. I wish our dog would agree to wear costumes. We did attempt once, but he chewed if off. Ugh. I have seen the movies and they are truly family orientated. That was one awesome party package! I love the coffin package! It looks like you all had a FUN time as a family adventure!! Thanks for sharing your ghoulish time!! Very clever ideas!! I love that dog costume. My little fur kid would love to dress up like that for Halloween. I have to get a copy of HT 3. My kids (and me) love the Hotel Transylvania series! It’s cool that you got a kit of goodies. I have yet to see this movie. I’ll keep a look out for a Halloween showing. I love Hotel Transylvania and was able to come in a Mavis inspired costume a couple of years ago. This year, I am stil undecided but I would definitely love to get my little furball, Crumpy the puppy costume you featured. It is so cute. Any suggestions on where I can get it? Actually, the wings were ‘borrowed’ from a standard Mavis costume available at most retail stores. It is the removable wings that were just small enough (even though the costume was adult-sized) to fit our puppy! We love this series! My kids were thrilled to get the box too. We can use the coffin for decor. It was a fun movie. Not a keeper but i like the crafts you did for the movie. That is great family time.